What Do They Expect From A Messiah? Question: Millions of people in the world are waiting for the Messiah. Why didn’t the Kabbalists explain from the start the meaning of the concept of “Messiah”? Answer: It is impossible to explain that to people. I will try to explain it to you and you will try to pass it on to others. Everything depends on awareness. All in all, our bodies belong to the animate level, but as of today, we identify with it: feed it, wash it, and put it to bed; in short, we constantly are concerned about it. That is the way I am built, as long as my body lives and is healthy. And if I am sick, then I feel bad, and if it dies, then I also die along with it. Since it seems to me that besides it, nothing exists. But the time has come when we can develop our awareness and rise above the body so as not to feel life in it and see the world through it. This new, broader, higher perception is not limited by the framework of the body and is called “integral awareness.” With the help of the connection with others, I rise above my physical body, and through the connection between us I begin to feel reality in a much broader sense. It is perceived not only within my body, but also within several bodies together, in the connection between us. I feel us all as one new body. It used to be only me, but now we are building different kinds of connection between us to the point that we begin to live a new mutual life in one system, all of us together. Instead of isolated and limited self-existence, each one feels the life of our general, spiritual body, or soul. And the way to feel this is only now opening before us. If I feel more of what is within the soul than what exists in my physical body, then I feel myself within this new spiritual body. 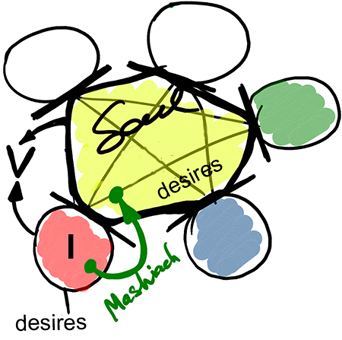 Actually, in both cases we are speaking about desires; even though these desires are mutual and are found “above reason,” they are already desires of bestowal. This is because I am like everyone who is found above my body that is covered by the Masach (screen). In this way, we enter a new reality, a new world, acquire new values, and measure life and death differently, as well as health, illness, etc. This transition, from the sensation of inside myself to the sensation of myself from the outside is far from simple and is executed with the help of a special force. It pulls (from the Hebrew word “Moshech” – to be drawn) me from the inner awareness to the outer awareness; thus it is called the Messiah. And in order to attain it, one really needs to exert.